US 175, an intrastate US highway that is signed east-west, begins by splitting off of I-45 just south of I-30 and onto the old "Central Expressway" south of downtown Dallas. Photo by Adam Froehlig, taken late July, 2000. First reassurance shield on what used to be US 175 prior to mid-2002. Photo by "SwissJohn". A view along southbound US 69 in Jacksonville. 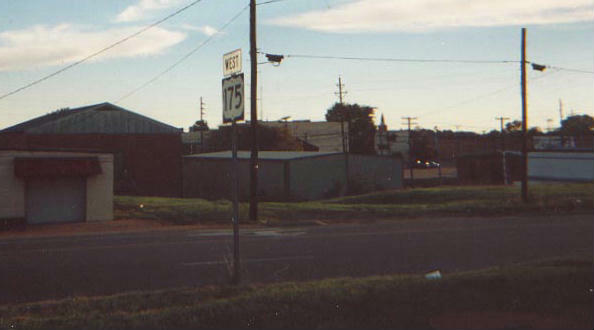 Prior to mid-2002, US 175 ended here, and before that it used to follow US 69 across the bridge in the background to end at US 79 on the other side. TxDOT build a new alignment for US 175 on the north end of Jacksonville, to avoid a series of multiple turns within the city. Photo by "SwissJohn".